Jamie’s father Paul’s highest finish in the Isle of Man TT is 26th, which came in the TT2013 Sure Sidecar 2 in which Paul was alongside Stephen Ramsden. The Manx GP is where Paul had most success, finishing 2nd three times, and 3rd once between 2008-10. Jamie made his mountain course debut in 2010, finishing 4th in the Newcomers A race at the Manx Grand Prix. 2011 saw Jamie finish 4th again, however this time in the feature Junior Manx GP race. In 2013, Jamie moved up to the Isle of Man TT races taking two top twenty finishes in the two Supersport races, the best of which was 16th in the second four-lap races. He won three bronze replicas that year, setting a fastest lap of 122.072mph. When asked what he believed to be his greatest achievement to date, Jamie responded, “all of my racing so far has been an achievement. If I was told at the beginning of my career I would be in the position I’m in, with a great team and bikes to ride I would have laughed. But I have to say 2017’s Classic TT on the 500 Manx Norton on my own for 4 laps, and to be the only person to do 110 mph on a single cylinder machine around the mountain course has to be my biggest achievement.” Jamie finished the 2017 Classic TT race in second place, behind Josh Brookes. 2017 as a whole can be seen as the rising star’s best year, with ninth and 11th place finishes taken in the Superstock and Senior TT races respectively, recording a new personal best lap in the latter at 128.059mph. Finishing above Michael Dunlop is an achievement in itself and Jamie achieved this in the 2017 Ulster GP Superstock race, when he finished in sixth place, one spot ahead of Dunlop. He also took sixth and ninth in the two Supersport races and seventh and eighth in the Superbike races at the Dundrod meeting. Coward also achieved a string of top six finishes at the Southern 100, becoming the fifth fastest rider ever around the Billown course, and at Oliver’s Mount, Scarborough. Meanwhile, the North West 200 saw him take two top ten finishes in the Supersport class. 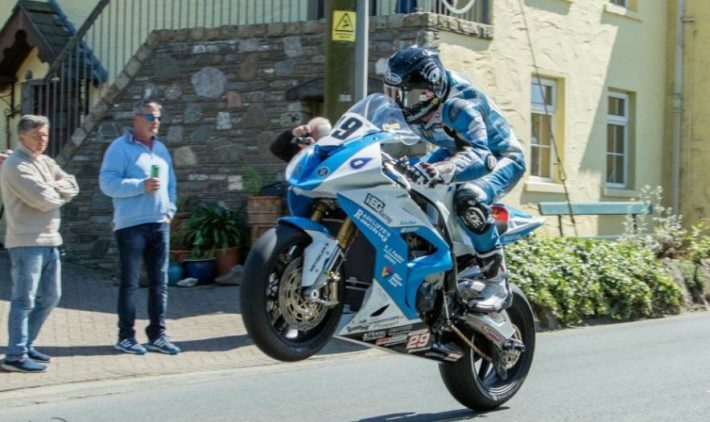 The highlight of Coward’s 2018 Isle of Man TT was a superb 8th place in the Senior race riding a 2015 BMW 1000 RR, over 30 seconds ahead of 9th place Davey Todd. 12th place in the Superbike TT was the other race which Jamie finished, in what proved to be a frustrating week as he was forced to retire from the Superstock race and both Supersport races but he did set a new personal best lap in the Senior with a speed of 128.877mph. The Classic TT proved to be a much more successful affair for Coward, where he was runner-up in both the Senior race, riding the 1970 Norton Manx, and the Junior on the 1980 Honda Craven K4. Fifth place in the Superbike encounter, which was won by Dean Harrison, capped a successful week for Jamie. He also contested the International Road Racing Championship for the first time where, riding for the Penz13.com BMW team he finished sixth overall with seven top ten finishes the highlights of which were fifth at Hengelo, Terlicko, Imatra and Horice.